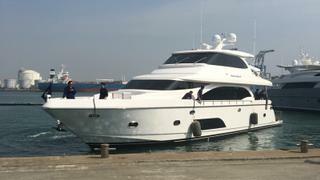 Taiwanese yard Horizon Yachts has delivered a 24 metre E75 superyacht to an Australian owner. The three decked yacht, which has been named Barbarelle II, has since been cruising the Whitsundays in Queensland. Another E75 is already believed to be under construction. Specifically designed for the Australian market, Barbarelle II features exterior design from John Lindblom while interior design was completed in-house by Horizon. She features an enclosed skylounge and three ensuite stateroom layout comprising a full beam master, forward VIP and a convertible twin guest stateroom. Her interior is populated with materials including white oak and light and dark coloured stones. Barbarelle II is fitted with a pair of Caterpillar C18 Acert-1136bhp for a max speed of 22.3 knots and cruising range of 374 nautical miles at 19.2 knots.